Bold Bluff – The Clutter Blog | You ARE Your CLUTTER. Celebrate it! 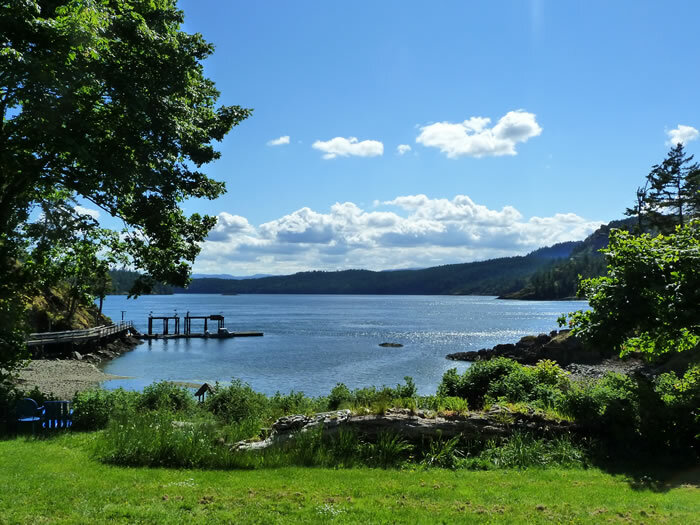 Three generations of my family has cherished Bold Bluff – a 101.6 acre property with nearly a mile of oceanfront located on the undeveloped South West shores of Salt Spring Island, BC. We bought the property in 1965, and shared it with another family for 22 years. Then my Father bought the other family out, and I have lived here for the past 19 years, raising my daughter, Maya, and taking her to school by boat in all sorts of wind and weather. It has been an adventurous life. 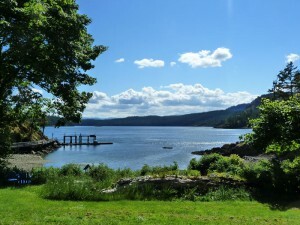 I live in a magnificent log house on the edge of a little eel grass cove. 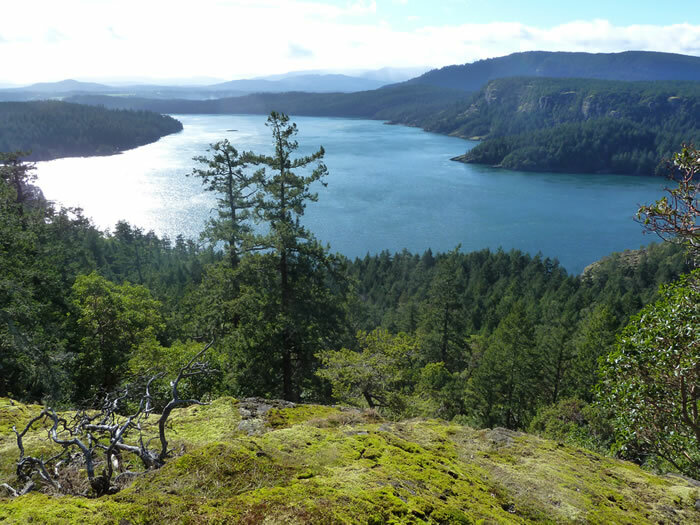 We face the steep cliffs of Vancouver Island and Sansum Narrows – a deep body of water with rich nutrients that feed wildlife: eagles, sea ducks, gulls, ravens, crows, cormorants, heron, seals, sea lions, whales, river otters are just a few. I have been lucky to have chosen this life style. There is no road to our home. We travel by boat. For 15 years I created and ran Bold Bluff Retreat. It was fun meeting couples and families who were passionate about Nature. Now I am selling and moving to town. 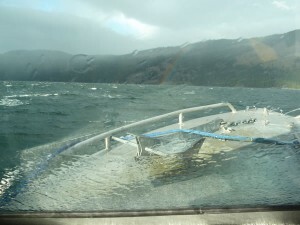 I am ever more aware of how dangerous it is for me to operate a boat alone in stormy weather or at night, when I have no partner to check in on me. For decades I enjoyed the thrill of being out in stormy weather – even in gale force winds – but not now. I want to be around for my grand children! Everything that came in, came here by boat or barge. Everything that goes out, leaves by barge or boat. Garage sales are impossible! Even lugging boxes of books to donate to the local library is a challenge. Fortunately, the new stewards of Bold Bluff want me to leave as much as possible (so they don’t have to barge in beds, tables, piano, etc). They even want my library (which I didn’t know when I began clearing my clutter). Dismantling my library has been one of my hardest tasks. The eclectic library inherited from my Grandfather, Father, Uncle and Aunt paints a portrait of my roots and my soul. Besides old books that were my dad’s favourites (HG Wells, Kon Tiki, Keats, Nabokov, Aldous Huxley, Yeats, Thurber, The Tales of Genji, Mark Twain, Goethe) I have accumulated on my own a large Natural History library. The only solace I found in getting rid of books was weighing them on a kitchen scale (to see how many pounds lighter I am!) and taking digital photos of the covers to remind me of the magnificent library I once created. The crunch is on. I must be out of here by June 30, 2012. My house is in total disarray. And there is no Mary Poppins to make it all right in one magic moment. My poor shepadoodle dog, Daisy, feels the chaos and scarcely will leave my side. Somehow I manage to enjoy the treasures that keep popping up in files I have hoarded for decades. When I find something particularly wonderful, I call friends to share the memory. And I tell all my island friends to please hike out here and give me hugs. I will provide tea and bake a cake! Even though I am alone, I need companionship and support during this challenging time. I expect you do, too, if you are simplifying your life and clearing clutter. My experience will be different from yours, especially since there is no road. However, there are common threads to this challenge many of us are facing as we grow older. I have had a heck of a lot of fun finding creative ways to get rid of stuff, and I hope you will receive inspiration to embrace the task with joy. Sansum Narrows separates Salt Spring Island from Vancouver Island, BC. My home is far below, where you see the little outcrop of rocks. On March 5th we planned to take 9 file boxes to my storage unit as it was a lovely sunny day – until we got into my boat. Suddenly the sky darkened, the wind whipped up, and it began to hail and snow, The sea was angry and a magical rainbow appeared! This gives you an idea of the unique challenges I face in getting rid of my stuff. 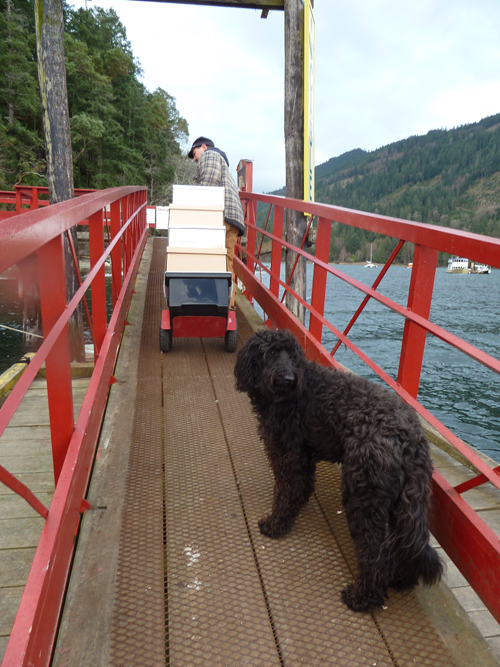 Here is Todd carting my boxes up the ramp, into my car, and on to storage.